Last Thursday, on our second official Hoboken Crew Ladies Night, the gals and I decided to take in a comedy show. This was partly inspired by the comedian who we encountered on our first official Ladies Night. He shall remain nameless, but I think it should be noted that on his official website, there are three images of him dancing back and forth like a metronome, and his events calendar was last updated in 2009. CK suggested we take in the comedy show at Comedy Cellar (117 MacDougal Street) for only $14 (plus the purchase of two drinks or food items) and all the girls were interested. About a week before the show, the names of the comedians were revealed, and we all became pretty excited. We were going to go see Aziz Ansari, Tom from "Parks and Recreation", also known in some circles as Raaaaaaaaandy, and one of my favorite people to follow on Twitter because I think he is hilarious. The other comedians on the lineup were Max Alexander, Lenny Marcus, Colin Quinn (from "SNL", "Tough Crowd", "Long Story Short" on Broadway), Tom Papa (host of "The Marriage Ref"), and Keith Robinson (from "The Wanda Sykes Show"). 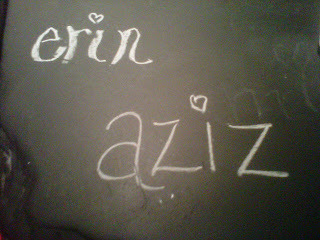 We met at the Olive Tree Cafe right above the Comedy Cellar and got some cocktails and wrote our names on the table with chalk. I tweeted @AzizAnsari a few times to tell him how excited I was to see him. I knew he was going to be just as excited to see me and would probably try to find me in the crowd and hang out with me after the show and then offer me a part in his next movie. The ladies and I walked downstairs around 8:45 as the show started at 9. The club was really tiny, so every seat had a good view, and in true NYC comedy club fashion, there was a brick wall behind the stage. William Stephenson, the MC for the evening, came out and immediately started making fun of people in the audience. I tried to catch his eye, but I must have been in a shadow or something because he did not even address me. Max Alexander was the first comedian in the lineup and I definitely recognized him from somewhere (perhaps from "The Tonight Show" with Carson, Leno AND O'Brien or from "Forgetting Sarah Marshall"). He was the most awkward of all the comedians and I found myself laughing a little out of embarrassment for him rather than for thinking he was actually funny. I think the next comedians, Lenny, Colin, and Tom did excellent jobs - and I'm not going to do any of their jokes justice by trying to write them here. Then, Andy Hendrickson came out to do his act. This is when I began to get concerned. Aziz Ansari was supposed to be next in the lineup according to the website. "Okay, maybe since he's like AWESOME, they just switched it up and they are saving him until the end," I tried to convince myself. I mean, yes, the website did say that sometimes the comedians are unable to appear on the nights scheduled, but no, that couldn't be happening here, right? But when the last performer came on and it was not Aziz, I was saddened. All of this anticipation just to be stood up. I can't even tell you if Keith Robinson was funny because I was sitting there with my arms folded wondering what I could have done for Aziz to not be there. Maybe I tweeted him too much. Maybe I came on too strong. Maybe he came into the club, saw me, and left. Sigh. I just have to remember there are other comedians in the sea. After reading your recap, the sadness in my heart is coming back again. Although, I must say that Lenny and Tom did an awesome job making up for Aziz ditching us! Aziz - we will never forgive you.